In the early 1970s, we became interested in purchasing a space for ourselves to have a sanctuary and a place for the religious school. We learned of the space that is presently occupied by Temple Beth Shalom. It was then occupied by a sports bar, Rudy’s 10th Inning Lounge. It took two years, from the night in 1971 when we walked into the bar to decide whether to buy the building, for Rudy to finally move out. 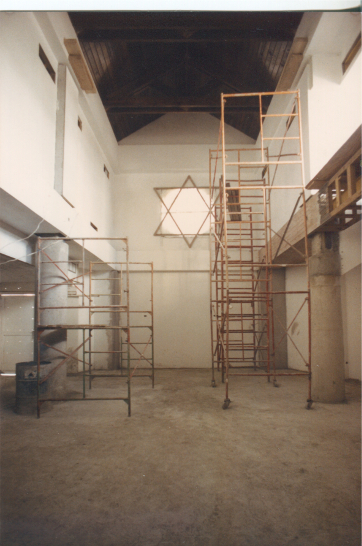 In addition to the bar, our future synagogue also housed a soda shop, a lingerie shop and a bakery. The second floor was home to four tenants. Where our Ark is now located, soda and other soft drinks were dispensed. In front of the steps leading to the bima was the bar where a bartender poured drinks. Our kitchen and the ground floor area leading to the bathrooms were divided between the bakery and lingerie shop. The entrance to the bar was where the memorial plaques are now located, and tables were arranged for patrons throughout our sanctuary area. For the first few years of Beth Shalom’s life, we prayed sitting on folding chairs and housed our Torah in a hand-made portable wooden ark. The Board of Directors held its meetings in the sanctuary and we struggled with a less than acceptable kitchen. When the upstairs tenants moved out, our religious school moved in. Several years later, we raised over $250,000 to create our beautiful sanctuary, designed by the legendary architect, Tom Marvel. Tom had part of the second floor ripped out so we could have the spiritually soaring ceiling in our sanctuary.